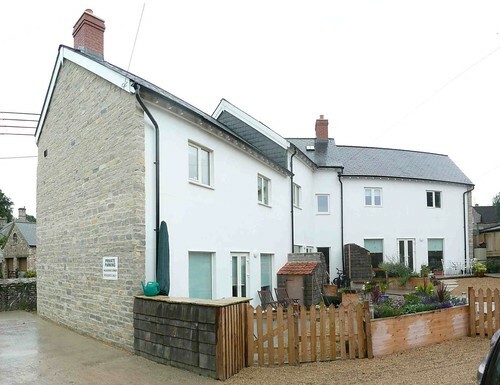 A very interesting terrace of three houses, on a curved road junction, has recently been completed in this Somerset village. Eco-slab ground floors and upper floors of expanded polystyrene rib and slab formwork with cast reinforced concrete covering. See Eco-slab detail for dealing with Radon gas in this area. In-situ concrete can create almost perfect air tightness – always something difficult to achieve with timber frame, especially if the building shape is complicated. In situ-concrete is good on acoustic insulation. There are sometimes complaints with timber houses on this score and it can be difficult to incorporate good sound insulation in some cases. Concrete is good for fire separation and this begins to matter with more than two storeys or where it may be advantagious to design flexibility into a building so that certain areas can be isolated from others at a future date. See Lifetime homes"Lifetime Homes make life as easy as possible for as long as possible because they are thoughtfully designed. They provide accessible and adaptable accommodation for everyone, from young families to older people and individuals with a temporary or permanent physical impairment". See the Lifetime Homes page and the Lifetime Homes Foundation web site. Concrete can help with thermal massthis is about how much heat something can absorb - so it involves its specific heat capacity and its volume. It can be useful for levelling out the peaks and troughs of temperature within a house. 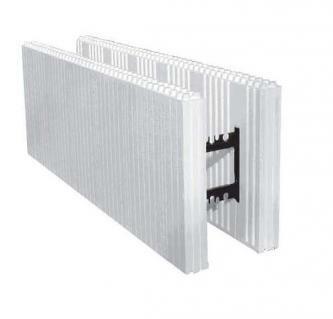 See the page on thermal mass and the inner layer of insulation afforded by ICFs means that a higher internal surface area temperature can be achieved more quickly when the heating is swithched on. See Decrement delayThis relates to the lag time that insulation itself takes to heat up or cool down. It introduces a delay into the effect of the insulation. This can help level out peaks and troughs of temperature. See the section on Decrement Delay. The problem with all this concrete and polystyrene is one of embodied energythe total amount of energy it takes to make a material (or a building). See more on embodied energy. Both of the materials rate badly in this respect. The pouring of concrete is also a job which requires some experience and expertise. 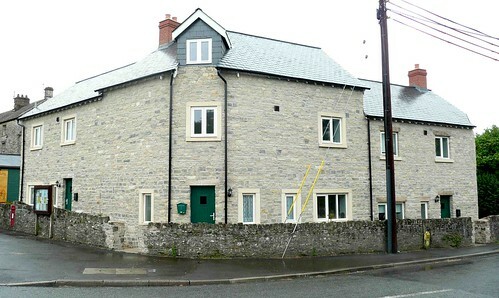 These houses were clad in local stone on the front and end elevations to satisfy the planners. What was the floor system and insulation to achieve such spectacular results?